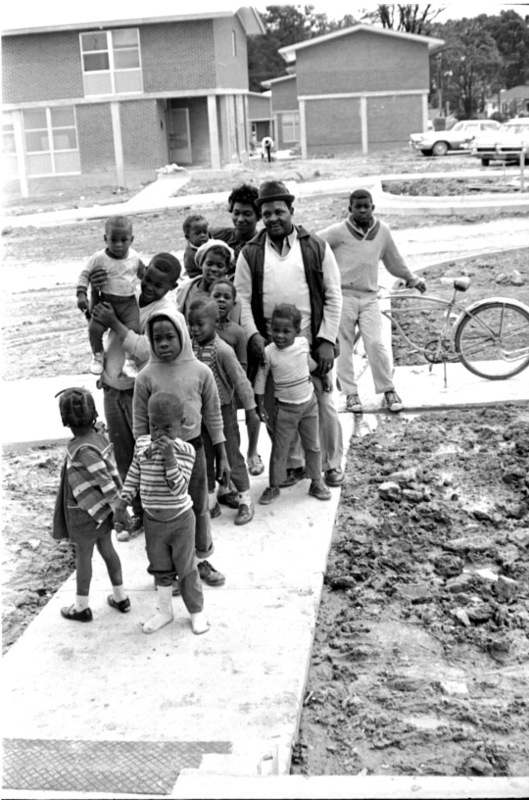 Fayette Place was a large public housing project developed by the Durham Housing Authority in 1967; it supplanted a large portion of residential Hayti and served as 'replacement housing' for many who were forced out of historic housing by urban renewal. 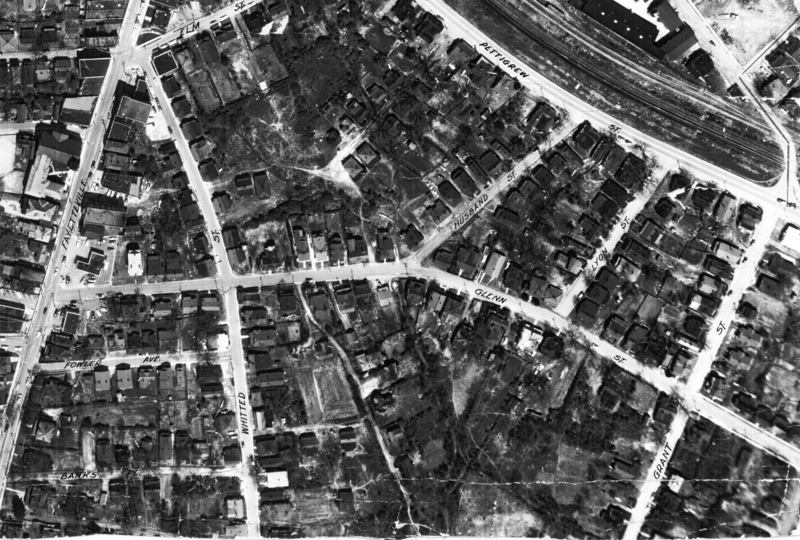 1959 Aerial showing the approximate area demolished and replaced by Fayette Place. For orientation, St. Joseph's (Hayti Heritage Center) is to the left of the "E" in "Fayetteville." The bulk of Fayette Place would be centered at Husband and Glenn, with Grant (still-extant) forming the eastern border. I've written many times before how, like most bad ideas, urban renewal had many roots in good intentions. We love to forget this, and look back on bad ideas as if they were perpetrated by evil people. Which allows us plenty of room to repeat our mistakes. For progressive folks, the good intention was decent housing. 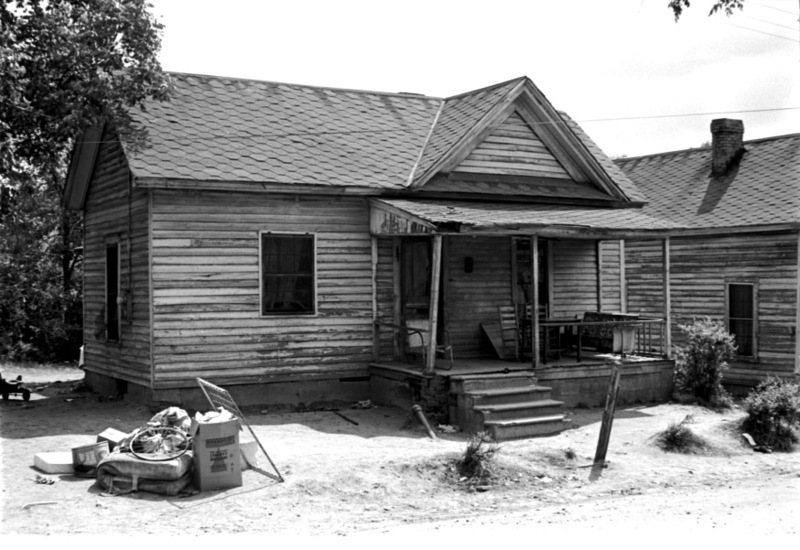 I've not read the article that accompanied this photo series, but the title is "14 member family moves," showing their move from a small, unmaintained house into new housing at Fayette Place. 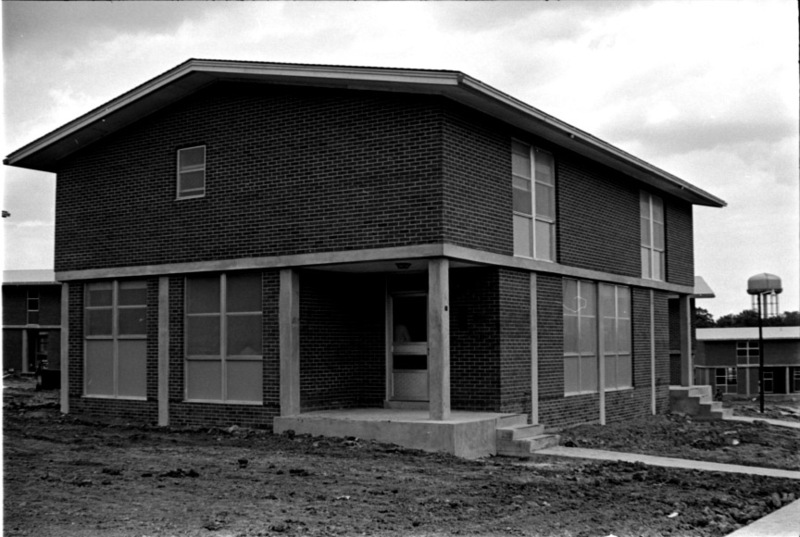 Like most public housing, Fayette Place rapidly went downhill for a multitude of reasons. At least in the U.S., government-owned housing just does not seem to work. Clearly, the private market for housing produces multiple market failures - mostly resulting in horrible housing conditions or people unable to afford housing. But the notion of public housing projects to plug the hole was a well-intentioned but unmitigated disaster. During the 2000s, much of the complex was empty. I'm unsure of the progression within DHA that led to it emptying out. In 2008 the Durham Housing Authority sold the 19 acre public housing complex for $4M to Campus Apartments, who evidently believed that they would build new student housing on the basis of a master lease with NCCU. It was the usual DHA deal - it was unclear if they were supposed to be selling it, they needed to pay back HUD for "improper use of funds," etc. NCCU wised up to the fact that they were paying bunches of money for vacant apartments at another Campus Apartments-owned property, Campus Crossing. They backed out of the deal, and Campus Apartments had no end game. As of 2009, Campus Apartments demolished all of the structures, leaving the slabs on the site. I would love to see a giant public art project on these slabs. I tried in the photos above (taken by mildly risking my life on the Durham Freeway bridge over Grant Street) to get the right perspective on these, but I couldn't. If you could be about 50 feet higher in the air, you look down on an awesome art installation. As of 2014, the site is one under consideration for the location of a new police department. Unfortunately, the political pressure from the Durham Committee folks is to not develop this site. And the city staff has followed suit with a suspect analysis of the site as brimming with economic potential, as if developers were chomping at the bit to develop this site, rather than the truth that an extant developer who owns the site is unwilling to move forward because there's no economic condition to support them doing so. That's not to say it won't ever have potential, because it's a big site closer to downtown than the market wants to recognize. But you can't change that perception through force of will, hopes and dreams or fairy dust. And there's a lot of that stuff where the former Hayti is concerned. I bemoan the loss of the Hayti community. But realistically, the highway-like stretch of Fayetteville Street between Umstead and the Freeway is junky, suburban, and devoid of character. And a lot of that is due to previous projects intended to 'involve the community' in the redevelopment of the old neighborhood. I honestly do think many of those people believe they have the best future for the neighborhood in mind, but it's a pipe dream that doesn't work in the market. Worst-case, a few members of the community cyncially co-opt that notion to insist that the city give them money to build something wonderful and instead enrich themselves. Perhaps the city has learned its lesson on this kind of mess after Rolling Hills and Murphy Street/Eagle Village. But the delusion that this area somehow deserves to become something special any more than any other part of Durham is damaging - both to it and to Durham as a whole.